Samsung announced its next-generation flagship smartphones on Sunday as expected -- the Galaxy S7 and Galaxy S7 Edge running Android 6 (Marshmallow). 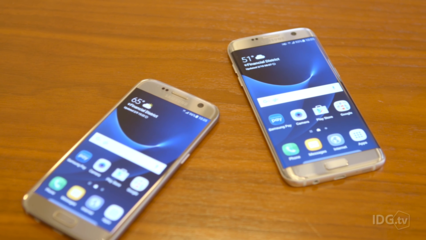 Both phones look strikingly similar to last year's models (the Galaxy S6 and Galaxy S6 Edge), but include features like a return to water resistance that was last seen in the Galaxy S5. The S7 has a 5.1-in. display while the S7 Edge features a 5.5-in curved display. Samsung also included an "always on" display feature, similar to the LG G5, another smartphone that was also announced Sunday on the eve of Mobile World Congress in Barcelona. Samsung said both phones have proximity sensors that will know when a phone is in a pocket -- to be able to turn itself off -- or in a darkened room, to turn down the brightness. With 4GB memory and powerful processors, Samsung estimated that both new phones operate 30% faster than previous models. Qualcomm will provide Snapdragon 820 processors for the models sold in the U.S., while phones sold in the rest of the world will use Samsung processors. There are a slew of other improvements, like a bump in battery power to 3000mAh in the S7 and 3600mAh in the S7 Edge. The batteries can be charged halfway in just 30 minutes, and wireless charging is enabled. Samsung Pay is supported, via NFC as well as by Samsung's Magnetic Secure Transmission technology, which Samsung estimated is supported by 90% of retail terminals. Analysts were concerned that the improvements in the new Galaxy phones would not be enough to compete with the coming next-generation Apple iPhone. There is growing worry that next-generation smartphones in general do not come with enough enhancements -- at least enough to get existing smartphone users to switch to newer models. "Looking at the big picture, I don't see enough improvement in the Galaxy S7 or Edge to move against the iPhone," said Patrick Moorhead, an analyst at Moor Insights & Strategy. "But this does make Samsung more competitive against other Android phones." Moorhead said he was especially impressed with the Snapdragon processor and the return of the microSD slot for storage expansion that was dropped in last year's Galaxy devices. But Moorhead said that, other than styling with the Edge, "it's not clear to me what the advantage is, and it is harder to hold," he said. South Korea-based Samsung said both phones will ship March 11, but didn't announce pricing. Smartphone vendors are facing a market that is still growing, but at a slower pace; there should be less than 10% growth in 2016, according to IDC, with more slowdowns predicted in the next five years. Samsung continues to be the largest smartphone maker in the world, while Android -- from a number of vendors -- controls 81% of the overall market, according to IDC. Samsung had 23% of the smartphone market in 2015, according to IDC, while Apple had 16%, followed by Huawei (7%) Lenovo and Xiaomi (both at 5%).